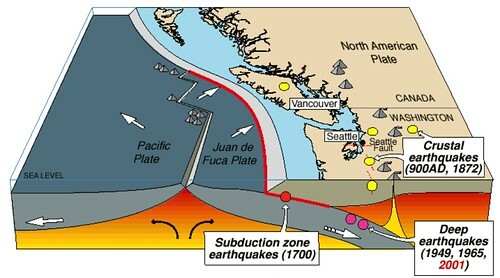 The most common source of damaging earthquakes in Washington and Oregon, are deep earthquakes that rupture faults within the subducting Juan de Fuca plate, "intraplate" earthquakes. These occur beneath Puget Sound at depths from 30 km to 70 km. Although plate interface earthquakes can be much larger, and crustal earthquakes and can be much closer to our cities, damaging deep earthquakes are the most frequent. They have historically occurred about every 30 years. The USGS estimates there is an 84% chance of another deep earthquake, of Magnitude 6.5 or greater, striking the region sometime in the next 50 years. This schematic diagram shows the relative positions of the Juan de Fuca and North American Plates. The pink circle shows the depth of the 1965, 1949, and 2001 earthquakes in cross-section. The 1949 earthquake caused over $100 million in damage, including damage to the Capitol Building in Olympia. The 1965 earthquake caused over $50 million in damage. In 2001, the Nisqually earthquake near Olympia shook western Washington and caused over 500 million dollars worth of damage. Recently there has been growth, development and greater economic activity in the Puget Sound area, increasing the likelihood of costly losses from future earthquakes. Deep intraplate earthquakes usually are caused by normal faulting, and reliably have very few aftershocks. These earthquakes occur where the plate is bending as it plunges beneath North America, and may also be associated with mineral changes as the plate encounter increased temperature and pressure. Stresses cause faults in the downgoing crustal part of the plate to rupture. While many subduction zones feature deep interplate earthquakes extending to depths exceeding 600 km and with different characteristics, Cascadia's deepest earthquakes are about 100 km deep. Discover more about the Cascadia deep earthquake hazard in a booklet created by the Cascadia Region Earthquake Workgroup.